I said I wasn’t going to write this week. I had plenty to do: meals to plan, classroom to set up, lessons to write, not to mention getting X ready for school. So why have I set put text on the screen? Well, my heart is bursting with the overwhelming kindness of others, mostly from strangers. Let me begin, last week I set aside time to get a hair cut. I went to my normal lady, made a few jokes about not visiting in awhile, and chatted with the other customer. My hairdresser is a mom at our school and has helped with our PTO. We chatted about school and I asked how her daughter was doing. I made a few jokes about how crazy and sweet middle schoolers can be. In the end, I went to pay and was told it was taken care of. Seriously, I thought?!? How?!? I found out the other customer had covered the cost. She wanted to tell me thank you for everything I do for our students and community. I was both shocked and blessed by her thoughtfulness. A simple act of kindness. The next day X needed his final shot to attend Pre-K this year. I had to go to HEB to get it, not our regular doctor’s office. As I waited and filled out paperwork, X begged me to read him a book. I told him as soon as I finished filling it out, I would. Next to me was an older woman waiting on a prescription to be filled. She offered to read to him. Surprisingly, X stood next to her and hung on her every word. I finished my paperwork, turned it in, and gazed at the simple act of helping another human out. I’m sure she enjoyed it too. Of course, getting the shot was stressful and painful, and X didn’t like it either. Because of one woman’s simple gesture, waiting was enjoyable. A simple act of kindness. A few days later, I went to Target to get a birthday gift and take X to a friend’s party. I stood waiting by the family bathroom. I was going to attempt taking X in. A big deal for a kid with a fear of bathrooms. My stress level was high. A lady walked by and simply said, “You look beautiful.” I needed that. 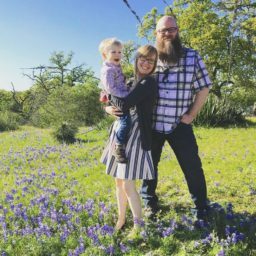 My little baby bump feels more like a mountain, my clothes don’t fit, and I’m having trouble lifting my own 4 year old. I don’t feel beautiful, it feels like a struggle with my own body. One simple compliment, and my stress level went down. And believe it or not, X walked into the family bathroom and I was able to pee at a public facility without assistance in, well, forever. And I’m pretty sure I’ll wear that same dress again. All from a simple act of kindness. Then last night, after a long day of meetings, I come home to an Amazon package. Not a big deal, I mean, I overuse my free two day shipping to avoid going to the store. 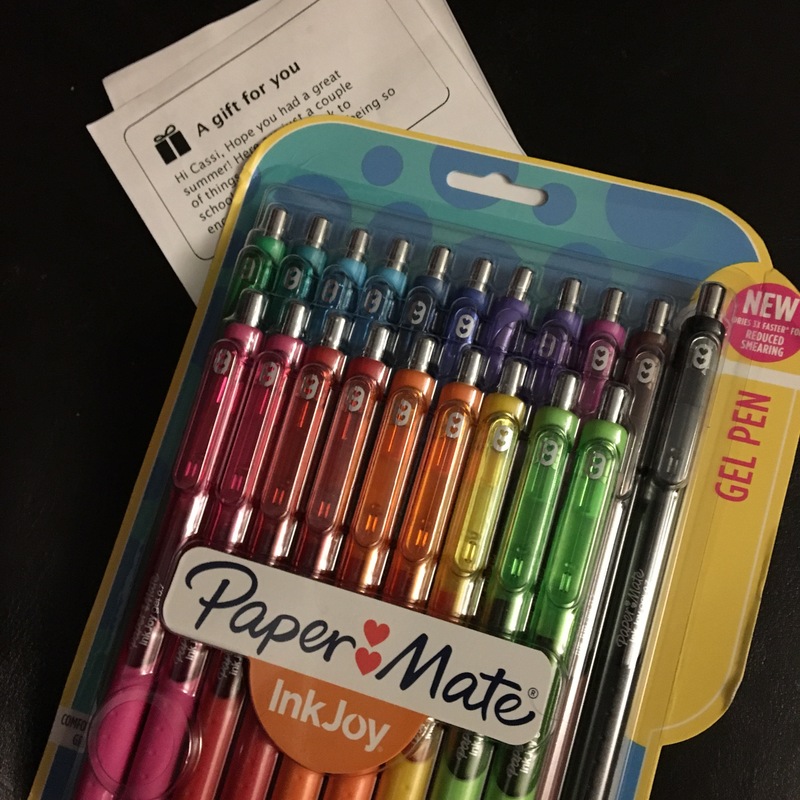 When I opened it, instead of a necessity there was a colorful pen pack and a note: “Here are a few things to start the school year off with… From a friend.” Another simple act of kindness. Simple acts of kindness. In a wide variety. They ranged from costing nothing to $20 dollars. I sometimes think we are waiting on a President, a principal, or a church leader, to fix our broken world, yet we forget how much of a difference “Love your neighbor” will do. My Bible study for the week is over Philippians 4. I’ve focused on this verse because I’ve been feeling especially weak. I encourage you, and myself, to be considerate, to show kindness, and to love your neighbor. A simple word or gesture might change the course of their week, and bring back a little faith in humanity. Thank you for sharing, so beautiful. This was filled with so much awesomeness, my joy is over flowing. Thank you for all you do for our kiddos. I hope you are blessed beyond measure this school year. Sweet reminder, thanks for sharing! !